Ketchikan, Alaska - My wife maintains a somewhat amused eye toward local "traditions" despite the fact she has now lived here 15 years. Often she spots things that I wouldn't even notice. Like dogs "driving" cars. Okay, they aren't actually driving the cars. They can't reach the pedals. And without opposable thumbs they have a heckuva time manipulating the climate controls. But if you look at the car going past, all you often see is the dog's head next to the steering wheel. I hadn't really noticed this tradition until Charlotte pointed it out a couple of weeks ago. Since then I have noticed it at least four different times. Alaska, where men are men, where women win the Iditarod and... where dogs drive trucks?? One car was a sporty little convertible with a Maltesey sort driving, white hair flowing like Jayne Mansfield in the breeze. One SUV had a thin little Dachshund riding on the owners lap. One truck zoomed by and I never even saw an owner. All I saw was a black lab on the driver's side. Tongue hanging out, black hair billowing. Maybe that was the owner. And finally some sort of Chevy sedan whirred by with a German Shepherd in the pilot seat. This large dog also obscured view of owner, although there was a decidedly un-dog-like bare arm resting in the open window on the dorm frame. "What's up with the dogs in the cars?" my wife asks. I don't have a really good answer. "Maybe it's because the trucks don't have back seats," I offer. "It's better than sticking them in the back in the rain." Of course, that answer is 100 percent pure humpy-piffle. If you look around, you still see plenty of dogs in the backs of trucks. More often than you see dogs "driving." "Maybe it's because we just love our dogs here and want them to share in the joy that is driving?" That's probably closer to the mark, but if that were truly the case, then we probably wouldn't stick them out in the back of said pickups for hours on end in all manner of crappy weather, claiming all the time that they prefer that to being left alone "at home." In pondering it further, I think it is a reaction to all those increasing restrictions on how we handle our children in vehicles. In the old days, you could transport your progeny around any which way, with the exception of strapping them deer-like to the hood (not that there weren't times we would have deserved that). You could lay on the front bench seat - unrestrained for goodness sake - with your feet under Dad's steering wheel and your head in your mother's lap. And it was - if not legal - then universally un-enforced. Today, of course, any appearance of such conduct will get you tagged a bad parent faster that you can say Brittany Spears. Unless you are a state trooper, but - as usual - I digress. Today, your child must ride in a special NASA designed safety seat guaranteed to protect them against the G forces of an X-15 rocket. The child must also - depending on age - be facing backward in said safety seat. Above all, they must not be in the front seat because airbags are "unsafe." The number of children who have been saved by deploying air bags far outweighs the number that have been hurt by them, but those cases don't make headlines or lawsuits, so they might as well not exist in our world. At this rate, I suspect that the powers that be will eventually declare that children should not be in vehicles at all, unless they are driving. Thank St. Fido (patron saint of dogs), then, that despite our best efforts, dogs have not been legally tagged as children. Because as part of our rugged Alaskan identity, we are required - since we can't drive around with our children on the roof - to have our dogs in the front seat with us, preferably sticking their noses into the wind on the driver's side. You can leave your dog in the back of the truck in the rain. You can let your dog bounce unrestrained in the back of the car,. And, yes, you can pretty much get away with letting your dog sit on your lap while you drive. I don't know whether it is strictly legal, but since the State Troopers are more concerned with ticketing folks who still have their snow tires on, they don't seem to notice all these dogs who have moved over from "shotgun" to the driver's seat. Is this safe? In a word, no. Years ago, I was tooling around the emptiness of Wyoming in a Chevy Van with two beagles for company. Natch, I was motoring at some velocity beyond the legal limit, but that is never a reason to draw the attention of the Wyoming Highway Patrol. It was the dogs that brought me to semi-grief. No, they weren't riding in my lap or even sticking their heads out the window. But we drove through an odor of dead skunk and they started tearing around the inside of the van like lunatics. Eventually ending up on the floor between me and the gas pedal and brake. This created much swerving and drew the attention of one of the forest green clad state constabulary. He patiently listened to my excuse, no doubt saddened that I wasn't really chemically impaired as my swerving seemed. He noted the dogs, now quietly curled up at my feet. "Next time," he said. "Get some cages." I got off with a warning to be more careful. 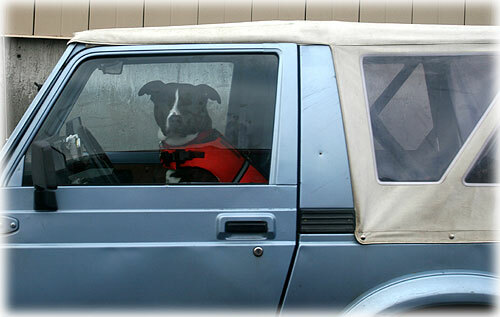 And I do want to note that that the dogs I have seen driving around Ketchikan lately have been pretty careful about. I have yet to any with a cigarette in one paw and a cell phone in the other.